Just Because Daisies Gerber daisies have long been many people's favorites and they make a perfect 'just because' flower. 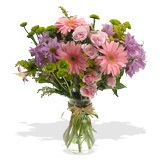 A gerber daisy bouquet creates a beautiful floral fantasy and adds splendor to any room. At our online florist shop we have a magnificent choice of daisy flowers in different designs, colors and arrangements. A cheerful bouquet of fresh daisies will arrive in perfect condition and make someone very happy, so dazzle them with daisies and watch the smile on their face grow!